Cats bring a lot of comfort and support to their owners, and maybe none other than Willow. Willow was in care at the National Cat Adoption Centre for some time before she was welcomed by the residents at a care home. "Willow is the perfect cat for our care home,' her new owners told us. "She is very gentle and good-natured and loves to play. "Willow likes to spend time at the front of the home and she is happy for everyone to stroke her when they come in and tell her how lovely she is! "All our residents love her and their faces light up when she pops into the lounge. 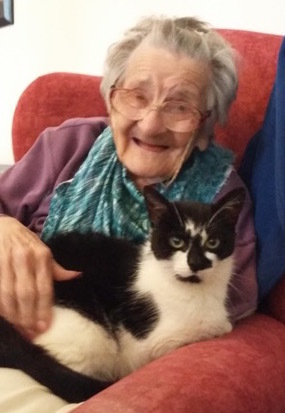 "There is always lots of chatter as those that had cats in their own homes - which is the majority of our residents - reminisce about their own cat and what they used to get up to. "She loves the garden especially the fish pond and last week she brought us two frogs! Luckily, we managed to rescue them and return them to the pond. Enid, pictured here, says “Willow brings happiness into the home. We all love her so much. She is so sweet natured and loves lots of cuddles. "Thank you so much for her she is really special."